IPMI 包含了一個 BMC (Baseboard Management Controller) 為主的控制器透過不同的介面去與其他分布在不同模組的管理控制器之間做溝通,,它定義了如何監控硬體和感測器,控制系統部件以及記錄重大事件,隨著 ipmi 在伺服器中的應用,他眾多的優勢就讓他成為集群伺服器管理中不可缺少的部分. 在 Linux 系統下可以利用 ipmitool 來實現對伺服器的 ipmi 管理. 關於 IPMI 我們常會聽到的 I²C ,smbus ,ipmi ,BMC , IPMB , 這幾個名詞.先來看一張圖之後再來一一說明. IPMI (Intelligent Platform Management Interface) 是一種可擴展的標準技術協定, 它定義了如何監控硬體和感測器,控制系統部件以及記錄重大事件, 而 BMC (Baseboard Management Controller) 控制器是 IPMI 的子系統,他主要負責與其他周邊控制器之間的模塊之間分配與管理. 從上圖可以看到 IPMI 可以透過 Serial Port , I²C 或是 IPMB,SMBus (加強版的 I²C) 匯流排 來與 BMC 溝通. 如果要透過遠端管理控制 IPMI 這時候需要使用到 RMCP (Remote Management Control Protocol)) 協定. 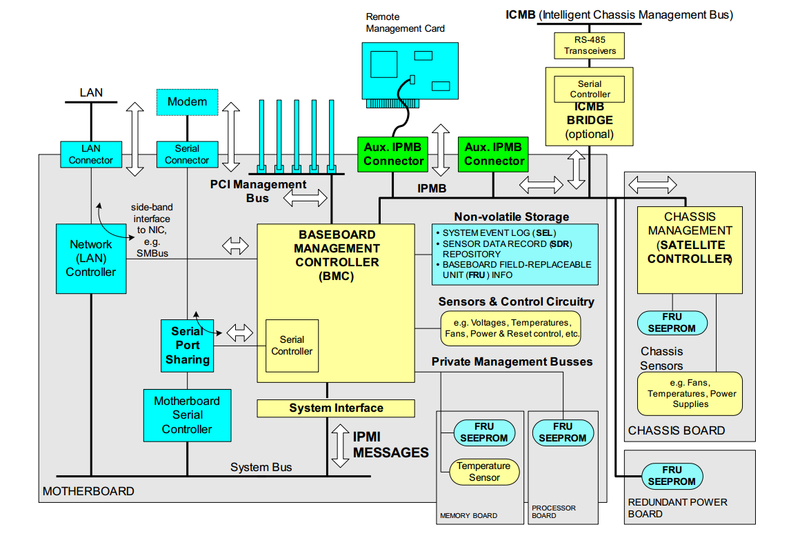 不管是 I²C bus (Inter-Integrated Circuit,讀法為 "I-squared-C")還是 SMBus(System Management Bus) , IPMB (Intelligent Platform Management Bus) 他們是一種慢速 serial bus 的協定,主要透過兩條線路的匯流排 （串列資料（SDA）及串列時脈（SCL）） 與電腦上的控制晶片(MC : Micro Controller)做溝通.以上圖得例子來說 MC 就是 BMC 了. 最早推出的是由飛利浦公司主導的 I²C 主要也是為了連接低速週邊裝置. 而 SMBus 是由 Intel 參考了 I²C 主要是為了系統上較慢速的裝置與電源管理裝置之間的溝通. 透過這套系統可以獲得這些裝置的設備資訊如型號或是狀態等資訊. 通常而言會將SMBus 視為 I²C 的子集,也因此 I²C / smbus 在某個程度上是相容的.目前 Linux 核心同時支援 I²C / smbus,在核心編譯的 Device Drivers 就可以找到 I²C / smbus . SPI (Serial Peripheral Interface Bus) – 一樣類似 I²C 的設計,不過它不像是 I²C 所做的 2線式設計, SPI 擁有 4線的同步序列資料協定. 非主板上的裝置是透過 IPMB (基於 IPMI 所發展出來的管理匯流排,也是以 I²C 為基礎所開發出來的) 與週邊裝置或是 ICMB Bridge 來溝通. PSMI（Power Supply Management Interface) 則是透過 SMBus 回報電源供應器實際使用負載狀況. PMbus (Power Management Bus) 就如同 SMBus ,只是 PMBus 應用在 Power supply 上面.他也是從 I²C 所衍生出來的. 而利用 ipmitool 可以實現 Linux 系統下對伺服器的 ipmi 管理.主要的監控管理方式還是透過 I²C / smbus ,不過不是每台電腦上都有配備 BMC 所以在沒有 BMC 時 Linux 底下還是可以透過另外一種方式 LM_Sensor 來針對 I²C / smbus 裝置來做較簡易的監控 http://benjr.tw/98312. 不過 BMC 是獨立於作業系統以外的一套機制,他不需要開啟作業系統才能做事.只要系統有電源時就可以針對他開始做監管的動作. OS 透過 System Interface (KCS, SMIC, BT, SSIF) 對本機下 ipmi command (不需要使用者及其密碼). 我們無法透過 #lspci 來查詢系統是不是有 BMC 的裝置,只能使用 #dmidecode 如果在 type 38 看到 IPMI DEVICE INFORMATION , 就表示系統有 BMC 存在. 基本上 ipmitool.sourceforge.net 提供了 .rpm 和 .tar 檔.可以依你的喜歡來安裝. 這邊我使用的是 RedHat Enterprise 4(kernel 2.6),可以看到和ipmi相關的模組,但如果使用的是 kernel 2.4 所需的模組又不同了. 2.6-based kernel 的 ipmitool 需要下面這些模組才能正確運作. An IPMI system interface driver for the message handler. This module supports various IPMI system interfaces such as KCS, BT, SMIC, and even SMBus in 2.6 kernels. 2.4-based kernel 的 ipmitool 需要下面這些模組才能正確運作. An IPMI Keyboard Controler Style (KCS) interface driver for the message handler. A driver for accessing BMCs on the SMBus. It uses the I2C kernel driver's SMBus interfaces to send and receive IPMI messages over the SMBus. IPMI requires systems to have a very capable watchdog timer. This driver implements the standard Linux watchdog timer interface on top of the IPMI message handler. 直接使用 ipmitool 來查看有什麼可以作為查詢的,下面是一般 ipmitool 所提供的系統上相關資訊. 這些都是比較粗略的資訊,如果你想要知道比較詳細的資料,可以用 #ipmitool sensor get 的指令來查詢更詳細的 sensor 資訊. [root@benjr ~]# ipmitool sensor get "CPU 1 TEMP"
這裡查詢了 "CPU 1 TEMP" 詳細資料,至於還有什麼可以查詢可以參考 #ipmitool -I open sdr 內的初略資料的參數來查出哪些 sensor 可供查詢. PMBus 的資料也可以透過 ipmitool power 來查詢. 我在 RHEL 6.1 64 bit 下試過是沒有問題的,可能 IPMI 相關的套件沒有全部安裝完成. 可以請教您IPMI side-band and out-of-band 差別嘛? 共用的 NIC 但 Mac 不同的網路埠. 只要是透過 ipmi 的協定,不管是透過 serial 或是 network 都算是. 相關的interface 介紹…或許看看IPMI SPEC (記得是Ch.5 之前）會比較詳細…. RMCP 是 ipmi 在傳送 ipmi 指令或是訊息時所採用的封裝格式,不過 RMCP 用於 ipmi 1.5 ,目前常用的 ipmi 2.0 的封裝稱為 RMCP+ ,兩者最大的差別為加密方式. 如果只是要透過 ipmi 管理 Power supplies 可以透過下面的指令. IPMI 的介面可以分為 LAN 以及 Serial Port. LAN 又可以分為專門獨立出來的 RJ45 埠給 IPMI 來使用,還有一種是用 sideband 的方式與 Ethernet RJ45 共享一個埠. 再來就是 serial port 也就是一般所說的 comport,他還可以透過另外一種方式 serial over LAN 來傳送. 這些在 BIOS 中可以看到 ipmi / BMC 的設定值.